WE HUNT LIONFISH FOR SPORT, WE HUNT THEM FOR FOOD AND TO PROTECT OUR CORAL REEF. In the western Atlantic Ocean, Caribbean and Gulf of Mexico the lionfish is a non-native invasive species without natural predators or any natural mechanism for controlling their population. They are the perfect predator with voracious appetites. Scientific studies have proven that a lionfish can reduce the numbers of small fish, juveniles and babies, young lobsters, shrimps, etc. by 80% within 5 weeks of establishing its territory. These are the same fish and other marine life that are important for the health and sustainability of the reefs and corals by keeping them clean and productive. 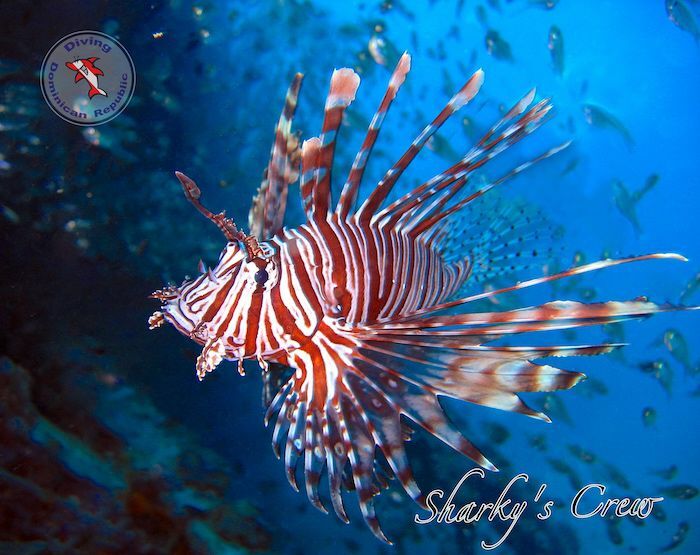 Sharky’s divers are helping local environment by the control of the lionfish population. Lionfish have 18 needle sharp spines that contain venom which includes a protein, a neuromuscular toxin and a neurotransmitter called acetylcholine, all used for protection against predators. These venomous spines can be very painful. Lionfish eat pretty much anything they can get in their mouth, up to 70 different fish, invertebrates and mollusks. Native marine creatures do not recognize lionfish as predators and are therefore easy prey. Lionfish eat the cleaner fish and shrimp that keep the other reef fish clean and healthy. Lionfish eat the algae eaters (eg. parrotfish) that keep the reef free of algae. Remember if the algae builds up and up the corals will die due to a lack of oxygen and sunlight. Lionfish stomachs can expand up to 30 times their normal size. Some lionfish have been found with as many as 40-60 prey in their expanded stomachs. A single lionfish can hoover up about 80% of the marine creatures in its area in just 5 short weeks. A lionfish can go up to 3 months or longer without eating and will only lose 10% of its body weight. Lionfish are sexually mature after just one year. The females are able to produce 2 egg sacks every 4 days and these egg sacks can contain 15,000 (Fifteen THOUSAND) eggs in each egg sack. The result can be 2,000,000 (2 MILLION) eggs per female per year. The egg sacks contain a noxious chemical, which means that many more of the eggs actually hatch compared to other fish because eggs that are surrounded by a noxious chemical are much less likely to be eaten, than some other fish eggs which are just released directly into the water. Lionfish are super delicious to eat, their white flaky meat is mild, delicate, tender and buttery. The world record for a lionfish is over 47 centimeters or 19 inches. Some lionfish in captivity have lived for over 15 years. No human has died from a lionfish sting. Please don’t forget Lionfish are a beautiful fish and it wasn’t their fault they took over the Caribbean and beyond. Contact Us now to book your private Lionfish spearfishing adventure! You may upgrade from a standard package for just 30 USD per diver/day.